The New York Times calls his music "vivid, turbulent, and rich-textured" and Folk & Acoustic Music Exchange hails his album Music for Moving Pictures as "A flawless gem...[of] rare beauty." His music is notable for his integration of a variety of influences, including the Western classical tradition, Afro-Cuban music, free jazz, and a variety of non-Western folk traditions. He has scored many award-winning films including Native New Yorker, WINNER as Best Documentary Short at The Tribeca Film Festival. Radio broadcasts include WNYC's New Sounds, ECHOES on NPR and Concertzender in The Netherlands. Awards for his orchestral music include ASCAP, BMI, Fromm, Gaudeamus, KUCYNA, and Percussive Arts Society. 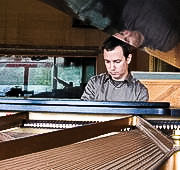 His training includes music composition at the University of Illinois and computer-generated sound at Stanford followed by studies at IRCAM. Alan Ferber is a Grammy-nominated and internationally renown jazz trombonist, composer and bandleader. 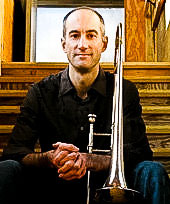 He has recorded six albums as a leader and performed on over 100 albums as a trombonist. The Wall Street Journal affectionately describes his music as “somehow both old school and cutting edge”. Having performed in venues ranging from the Lincoln Center, the Blue Note, and Birdland, Ferber has also appeared on TV shows including the Tonight Show, The View, and Good Morning America. 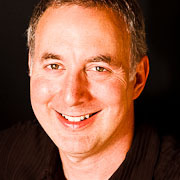 As an educator, Ferber currently serves as an adjunct professor at Montclair State University, the Peabody Conservatory and New York University. Hailed as a "new music veteran" by New York Magazine, this Eastman School of Music alumnus serves as the Principal trumpet of New York's Signal Ensemble, Wordless Music Orchestra, is the Artistic Director of the contemporary music collective Deviant Septet, is a founding member of the Brooklyn Brass, and is a regular collaborator with Alarm Will Sound. In addition to performances on Broadway shows such as "South Pacific", he has been heard live in radio broadcast performances on Radio Bremen (Bremen, Germany), and nationally on NPR among others, and has performed in venues ranging from Carnegie Hall's Stern Auditorium, to London's Barbican, to NYC's experimental arts spaces like Le Poisson Rouge. Gurfield can be heard in recordings on Sony Classical, Warp Records, Warner Brothers Classical, Naxos America and many others. Hailed by Time Out New York as a “dazzling diva, adept at old and new music” Soprano Mellissa Hughes enjoys a busy career performing with Alarm Will Sound, eighth blackbird, Newspeak, SIGNAL, My Brightest Diamond, The National, Victoire and The Breeders. Upcoming season highlights include premiers with both the American Composers Orchestra, the Carnegie Hall Dawn Upshaw and Donnacha Dennehy Workshop and recording Reich's Music for 18 Musicians with SIGNAL. Miss Hughes records for Nonesuch, Cantelope, and Naxos Records, and is a New Amsterdam Records Artist. Ms. Hughes holds degrees from Westminster Choir College, Princeton; and Yale University. Elaine is a prize-winning concert pianist, martial artist, Lecturer in Music at MIT, and National Music Festival Piano Mentor. She has performed solo and chamber music concerts globally and has been broadcast on TV/radio in the US, Canada, China and Bulgaria. She received standing ovations at her sold-out Carnegie Hall benefit concerts (2008-2012), and as soloist with numerous orchestras including the Toronto Philharmonia, National Music Festival Symphony, and Slovak Sinfonietta. She has appeared in dozens of magazines, books, ad campaigns and was profiled on the Oprah Winfrey Show, selected as a Power Woman of NY, a "Women Who Inspires" on the Better TV show, and as a 2013 Female Leader by ALIST Magazine. Elaine is Co-founder/President of the interactive concert series, Savor Your Senses™, and holds a Doctorate of Musical Arts in Piano Performance. “Quietly virtuosic” (New York Times) upright and electric bassist Eleonore Oppenheim is quickly gaining a reputation as both a valued ensemble player and an engaging soloist, as well as a go-to muse for young composers, and she has built a rich repertoire of solo pieces, some of which will be featured on her debut album “Home,” for which she received a CAP recording grant from New Music USA. Eleonore has performed and recorded with a variety of different artists, among them the Philip Glass Ensemble, Tyondai Braxton, Shara Worden (My Brightest Diamond), Ensemble Signal, Bryce Dessner (the National), Meredith Monk, Corey Dargel, and Buke and Gase. She is also a member of “All-star, all-female quintet” (Time Out NY) Victoire, whose debut album “Cathedral City” reached top-10 and best-of lists in the New York Times, Time Out NY, and NPR in 2010, and the new low-strings supergroup Bonjour. Multi-wind instrumentalist, composer, conductor, and recording artist Demetrius Spaneas leads a varied international career and has worked with such diverse artists as John Cage, Ray Charles, and Kyrgyz traditional musicians. He has been featured soloist and composer at major concert venues and festivals throughout North America, Europe, and Asia. Through his work with the US Embassy system, he has presented concerts and lectures on American music and culture throughout the former Soviet Union. His current initiatives focus on Central Asia, the Balkans, China, and Russia. He has won grants and awards from ASCAP, Meet the Composer, the American Music Center, and other organizations, including a special certificate from the Russian Duma (senate). Mr. Spaneas, a New York City-based artist, is a native of Lowell, MA and holds both bachelor and master of music degrees from the New England Conservatory of Music. Gregory Zuber is principal percussionist with the Metropolitan Opera Orchestra, having joined the orchestra in 1986, and with its alter identities, the MET Orchestra and MET Chamber Ensemble. Prior to that, from 1985 to 1986, he was principal percussionist with the Toledo Symphony Orchestra. Mr. Zuber is an active soloist, recitalist, composer, and clinician, and performs regularly with Percussionists of the Met and his wife, flutist Patricia Zuber. Mr. Zuber holds a Bachelor of Music degree from the University of Illinois where he studied with Tom Siwe, and a Master of Music degree from Temple University, studying with Alan Abel of the Philadelphia Orchestra. He is a faculty member of The Juilliard School and the UBS Verbier Music Festival.